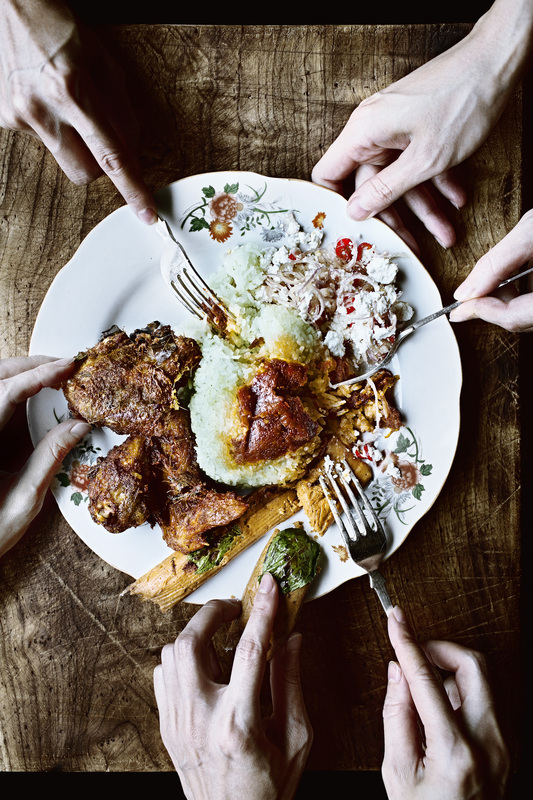 This part is my personal rendition for two of the most popular toppings for coconut rice, lemongrass fried chicken and fragrant fish cake called otah. If you are looking for a one-stop online shop for all the ingredients in this Singapore series, FILSTOP seems to be a good place to start. 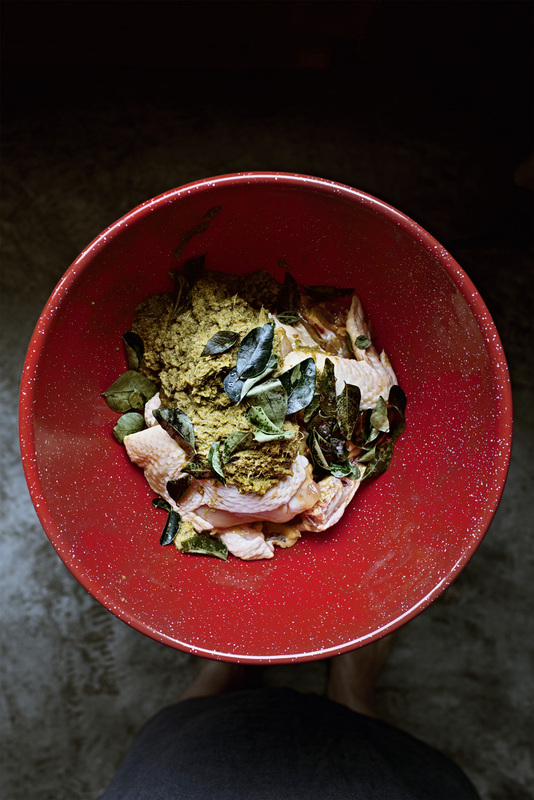 FRAGRANT SALMON SHRIMP CAKE/OTAH: In a blender, blend water, coconut oil, Thai red curry paste, dried shrimps, cashew, ginger, shallot and ground coriander until smoothly pureed. Transfer into a non-stick pot (or else it will burn easily) and cook over medium heat, stirring occasionally, until most of the moisture has evaporated, and the mixture is deeply caramelized and dark read in color, about 15~20 minutes. Transfer it back into the blender, along with salmon, shrimps, coconut milk, kaffir lime leaves, egg, dark brown sugar and lemon zest. Pulse as many times as needed until the mixture turns into a thick, sticky paste. If using dried zongzi leaves, bring a pot of water to boil then soak them for 30 minutes to soften. 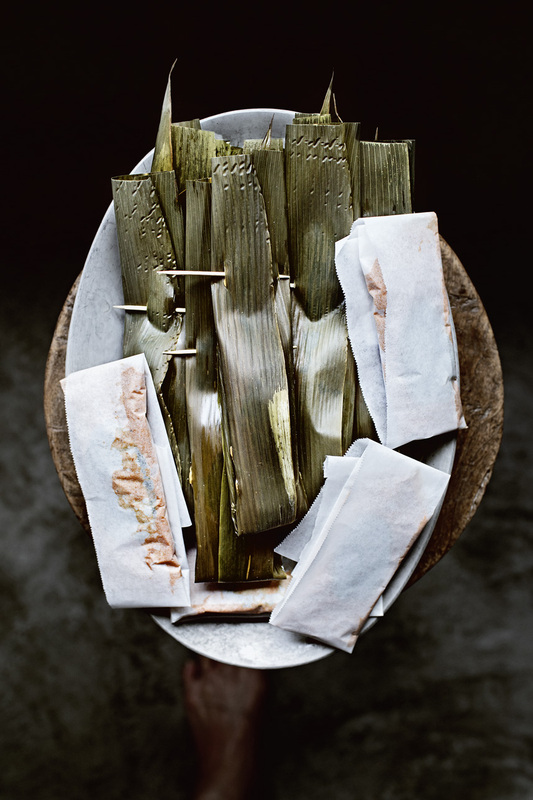 If using banana leaves or parchment papers, cut them into large rectangles about 16" x 5" (40 x 13cm). 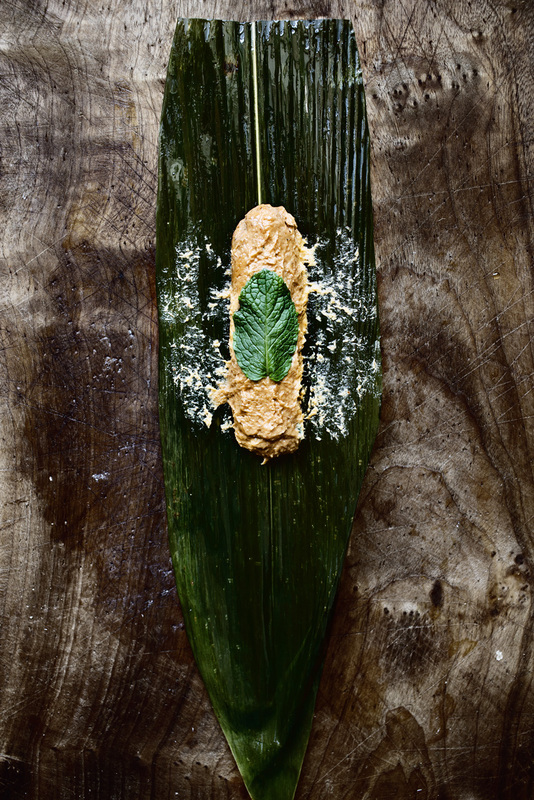 Brush the surface of the banana leaves or zongzi leaves with a bit of canola oil, then place a long dollop (about 3~4 tbsp) of the salmon-mixture in the the upper-middle location (see photo "salmon shrimp cake 3"), then press a fresh mint leaf into the surface of the filling. The width of the filling should NOT exceed 1/3 of the width of the wrapper, and do not attempt to over-stuff it. Length-wise, fold one side of the wrapper over the top of the filling, then another side over to enclose, like folding a letter. Then bend the longer end of the wrapper (fold it at where the tip of the filling ends) towards the back, and secure the two ends of the wrapper together with a toothpick. If you're using parchment paper, you don't even need toothpicks (see photo "salmon shrimp cake 4"). Heat a cast-iron skillet or griddle over high heat. Grill the wraps until the leaves or parchments are charred on both sides and the fish cake is cooked, about 4~6 minutes. Can be made the day ahead of time, and kept in a container inside the fridge until needed. Before serving, reheat gently a little on the grill or inside the microwave just to warm up. 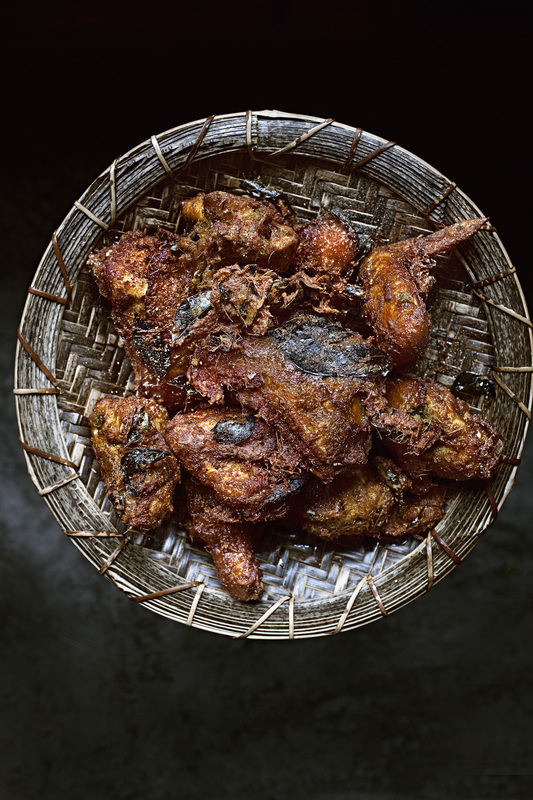 LEMONGRASS FRIED CHICKEN: Wash, pat dry, and place the chickens inside a large bowl. Since the marinate is "raw", we have to pre-toast the shrimp paste for a more well-rounded flavor. With a spoon, press the shrimp paste in a small skillet and toast over medium heat until dry and crumbly, essentially cooked. Transfer it into a blender along with water, lemongrass, ginger, shallot, garlics, fish sauce, ground cumin, ground coriander, curry powder, ground white pepper and salt. 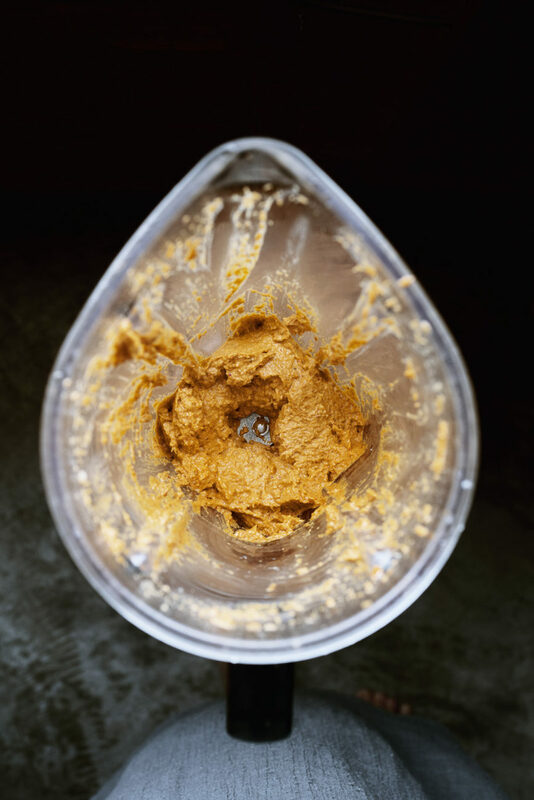 Blend until the mixture is a slightly fibrous puree. 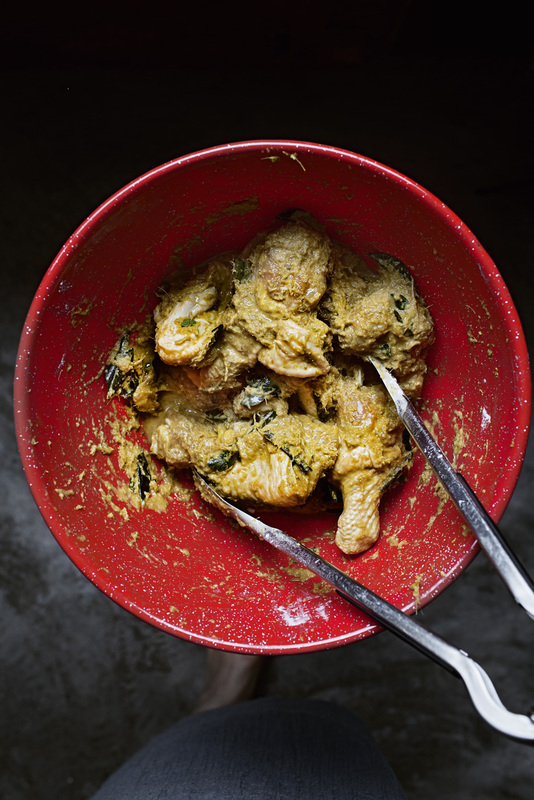 Transfer the marinate over the chicken, and add fresh curry leaves if using. Toss until even then cover with plastic-wrap. Marinate for at least 6 hours or overnight, flipping once. Add enough canola oil in a frying-pot until it reaches at least 2" (5 cm) deep, and heat over medium-high heat util it bubbles up immediately around an inserted wooden chopstick (about 330 F). Meanwhile, add vodka and potato starch, and mix until evenly incorporated. The liquid should resemble a very watery batter, which will help the lemongrass marinate stick onto the chicken. 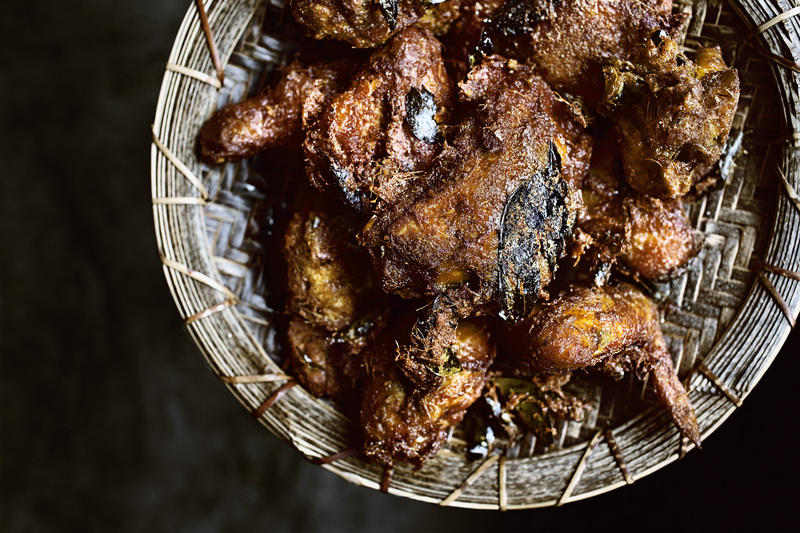 Use a tongs to grab the chickens, trying to include a good layer of marinate and curry leaves on the surface of the chickens, and lower into the frying-pot without crowding. Fry until *deeply browned (you have to go a couple shades DARKER for this recipe than typical fried chickens) and crispy on all side, about 5 minutes on each side depending. If the chickens brown too fast, lower the temperature accordingly. If at the end, there are individual curry leaves being left behind, throw them into the fryer as well and fry until crispy. Drain well, and dust with more ground white pepper. Serve immediately with the rest of the components. You can also fry the chickens a few hours ahead of time, then re-fry them for just a couple minutes to bring them back to crispiness in hotter oil about 350 F.
* I love the deep flavors that dried shrimps inject into the fish cake/otah, which is just not robust enough without it. So please try not to omit it, since it's so easy to buy dried shrimps online nowadays. 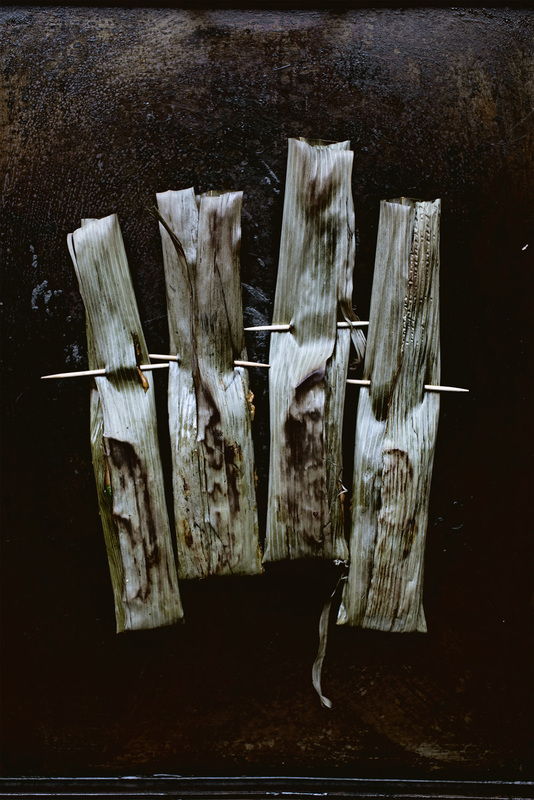 ** Traditionally, otah is wrapped in banana leaves and grilled. But I happened to have dried leaves for zongzi (Chinese sticky rice dumpling) and so that's what I used, which turned out to be much more fragrant than banana leaves. You can choose either one, but if both is unavailable, you can use parchment paper as well. But the final result will significantly lack an extra layer of aroma. **** You will not taste alcohol in this fried chicken. The vodka's high alcohol content will help create a crispier crust as the alcohol will be completely cooked off. I’m a singaporean and your version looks so much better than the ones we had here! Mandy you are simply wonderful. Thank you for all the delicious recipes. This looks absolutely delicious – thanks so much for sharing Mandy! This is probably a silly question (and perhaps I need to re-read the recipe :) but was wondering when do you put the chicken in the batter? Do you dip the chicken in the batter right before you put it in the oil? 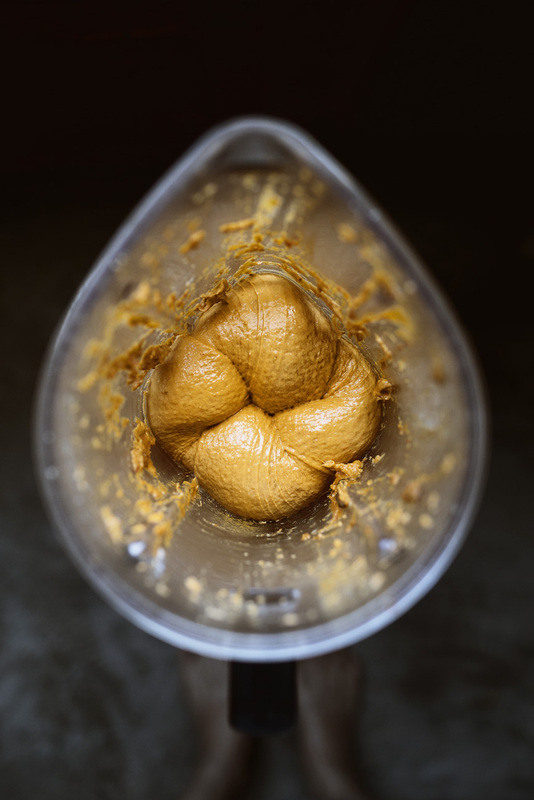 Or do you mix the batter in with the marinade? Can’t wait to try it! Susan, there’s no separate batter to dip the chicken into. You simply mix the starch into the marinate that the chickens are already soaking in :) Does this make sense?